Landscaping an attractive lawn is about more than just mowing, edging, and blowing a property every week, or two. Landscaping involves trimming shrubs, bushes, and plants. It also involves removing weeds that are overtaking flower beds, mulching certain areas, and planting new plants, as needed or desired. Beautiful, thoughtful landscaping can take a lawn from having a nice appearance, to a lawn that is the envy of those around them. If you are interested in landscaping services for your home or business, then contact Outback Lawn Service today. The lawn care experts at Outback Lawn Service have been in the business for a long time. We have seen all types of grasses, shrubs, plants, mulches, and so forth, on various properties. We know that plants that thrive in our Baltimore area, and we know that plants that struggle here, too. Our professionals want to share our knowledge of landscaping techniques with our customers, and for those that are interested, we have several landscaping services that we have available, too. Landscaping around the grassy areas of one’s property, can be an artform. There are many mulching materials from which to choose, there are many plant varieties from which to choose, and there are many different patterns of how one can landscape within their own yard. 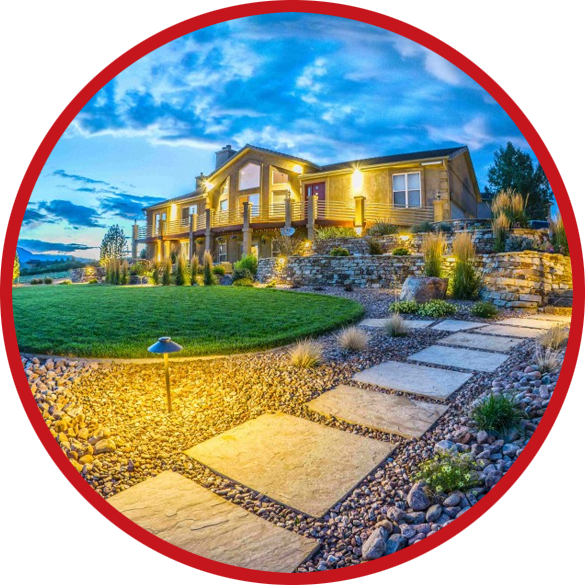 The professionals at Outback Lawn Service offer landscaping appointments, where we will discuss these options with you, as well as provide you with free quotes on any potential landscaping projects. We have a lot of ideas that we can share with you, as well as a variety of plans that will fit every budget and every lawn. Whether you are the owner of a residential property or of a commercial property, then we would like to help you with all of your landscaping projects. Our experience, industry knowledge, and attention to detail may just come in handy, as we discuss with you, your own landscaping ideas.